2. So, things have gotten a bit exhausting in our household. Two kids is easy WHEN they are healthy and when Daddy Bear is around and the kids don't get up at 5am everyday. On Monday night I discovered that Koen has hand, foot and mouth disease. Again. You can get it more than once if it is a different strain. When Koen gets any kind of illness that affects his skin, he gets is so bad. I'm so thankful it isn't an itchy rash but he is covered. Worse though, besides needing to avoid all social situations, is that he is not himself. So whiny and grumpy. Understandable, he feels terrible. So thankful he is out of diapers because I think changing his diapers right now would make me vomit...yuck! I was worried Kai had it too due to the vomiting on Saturday but other than cold like symptoms, he doesn't have a single spot. I kept him home from school yesterday just in case. Hopefully he feels better tomorrow. I'm glad I kept the kids home from church on Sunday as they were under the weather! 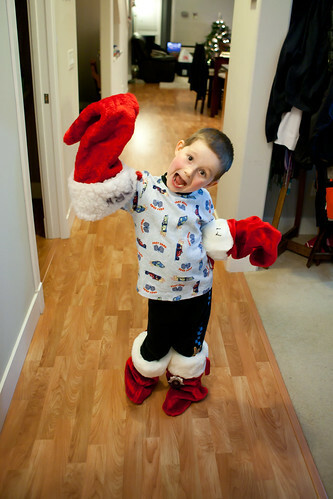 Kai has his school Christmas program this afternoon and tomorrow evening...looking forward to it! 3. Smallest thing ever but I have two of the hugest zits ever (yay second trimester!). One is in my dimple so if I smile all the time, it sort of hides that one. Again, they are huge. Kai was pretty fascinated by them and a little shocked that he can get some as a teenager. 4. Went to the TMJ specialist yesterday. I was nice and relaxed but alas, the procedure was not a success. And, I wish I had known (although they did tell me) that it would not be painful. Way less scary than the chiro. The one thing I have going for me is the amount of the relaxin hormone in my body right now, it loosened everything up so it made it easier. Oh well. I had my mouth guard adapted and had a lower splint made which I have to pick up next Tuesday. These mouth pieces will prevent my teeth from coming together thus leaving a space for my disk to potentially go back into place. Again, this has a 50% chance of working. So, the mouth splint, the appointments (plus 3 more) and the procedure cost $1300.00. Awesome. Can't think of anything else I would've wanted to spend my money on. I'm interested to see how much of it is actually covered. I'm hoping for about $400.00 in coverage. Oh ya, and every time I go, it's a one hour drive away. 5. Gary's basketball season has not started out well. It is really frustrating, for him and me, to see him put so much time in and not have the kids do what they can do. They lost two games by 4 points or less and in those games, they should've won by a large margin. I'm hoping things get better for them because I know how much Gary cares about it and how much work he puts into it. When I spotted the dots on Koen's hands and feet, I just kept saying `Shoot! Shoot!'. Koen then said, `This is frick'n nuts! '. I may have said that last week. Oops. That kid has an amazing memory. Too bad about your sick children. I will be eager to hear what you 5 pregnant sisters are up to on Friday. Keep smiling - even after your zit is gone! 1. i wonder if you're all going to be at the first birth together? whatever it is, i'm excited to hear about it! 3. i'm in no trimester and get them all the time. sucky. Lots to respond to :) Your kids are cute. When I was changing Coby's diaper yesterday she commented 'Nasty!' Sounded a bit too familiar. I was interested to hear about how your TMJ treatment went - I have minor jaw pain so have been taking note, so sorry that it didn't go away!